I picked up some Swiss chard at the farmers’ market last week without any real good idea of what to do with it. I guess I’m attracted to colorful, peculiar vegetables that I’ve never tried. Sometimes this is a good thing, other times it leads to disaster. Luckily for the chard, I found a great, simple recipe for preparing it on Elise’s Simply Recipes website. She also says that fresh chard taste much, much better than old. Luckily I had a bunch that looked pretty good. Rinse off the Swiss chard leaves thoroughly. Remove the toughest third of the stalk, discard. Roughly chop the leaves and stem into inch-wide strips. Heat a saucepan on a medium heat setting, add olive oil, a few small slices of garlic and the crushed red pepper. SautÃ© for about a minute. Add the chopped Swiss chard leaves. Cover. Check after about 5 minutes. If it looks dry, add a couple tablespoons of water. Flip the leaves over in the pan, so that what was on the bottom, is now on the top. Cover again. Check for doneness after another 5 minutes (remove a piece and taste it). Add salt to taste, and a small amount of butter. Remove the swiss chard to a serving dish. Lisa – That looks soo good. I will definitely have to try that for the next batch! It looks almost like an Au Gratin or Creamed Spinach except lighter. 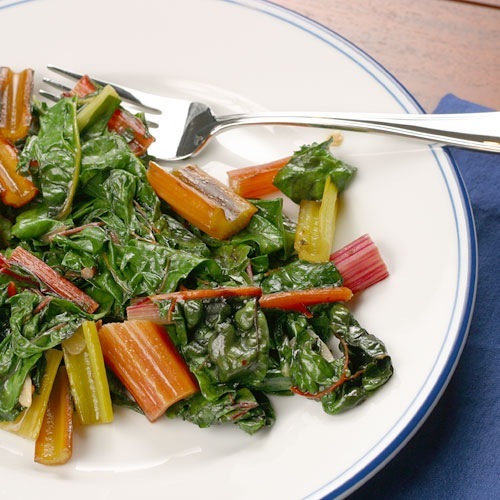 Fresh Chard already tastes a bit buttery, so that has to be out of this world good. from Helen at Beyond Salmon. I like to add some golden raisins and toasted pine nuts but even without the extras it’s still fanfreakintastic.